A winter run can have its advantages. The crisp, cool air can be refreshing and the quiet, empty streets can give a runner a feeling of blissful solitude. On the other hand, the wet weather can dampen a runner’s enthusiasm. Some fair-weather runners are reluctant to venture out during the winter months, but there are solutions to the problems a runner can face during winter training. Those concerned about running in the dark should try to make time for a run during lunch breaks. If early morning or evening runs are the only option, try to stick to well-lit areas and wear reflective gear. Bright fluorescent colours are better during the day, but in the dark go for white gear with reflective panels, as this shows up better in motorists' headlights. Attach reflective strips to the parts of the body that have the greatest range of movement, such as arms, feet and lower legs, as this will attract the most attention. Also, consider wearing a head torch to ensure drivers can see you long before they reach you. It can be hard for a runner to judge how much clothing to wear in the winter, as often he will set off feeling extremely cold and not long into the run will get hot and sweaty. Wear a couple of layers, one to wick sweat away and another to insulate the body, but avoid cotton as it retains sweat and will get very cold. If wearing a jacket, choose one that can be folded up and carried should you get too hot. Traffic can be an even bigger hazard in the dark, so be extra vigilant. When running on a road with no pavement, face the on-coming traffic. Only cross to the opposite side of the road when approaching a blind corner, and cross back as soon as it is safe. To stay motivated and safe, run with friends or other club runners when it’s dark. Fellow runners can drag you away from the comfort of the sofa when it’s cold and damp outside and running in a group is safer than pounding the streets alone. 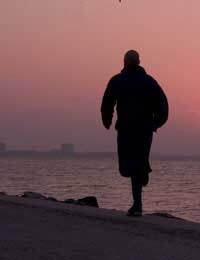 If running alone, be sure to tell someone when you are setting off and when you are due to return, and take a mobile phone. Rather than tackling the same route day after day, alter the runs to make your movements less predictable. Remember there is little point in choosing a route based on the scenery, because you won’t be able to see it, so try to find a well-lit run with an even surface. It’s okay to run with a cold, but stay at home if symptoms include a fever, chesty cough, chilliness and muscle aches. It’s not unusual for a runner to get a burning sensation in his chest during winter runs, but it’s nothing to worry about. It’s because hard, physical work in extremely cold air can trigger a narrowing of the airways. Try to breathe through the nose as much as possible, as this warms the air.